Transfer budgets are a useful way to track transfers between your transaction accounts or towards your assets and liabilities in PocketSmith. They help to create an accurate forecast on the Calendar page and make it easy to track each of your transfer categories on the Budget page. You can choose either expense or income - you'll deal with the other side of the transfer soon! If you selected Expense above, chose the account that the transfer comes from; if you selected Income above, chose the account that the transfer goes to. 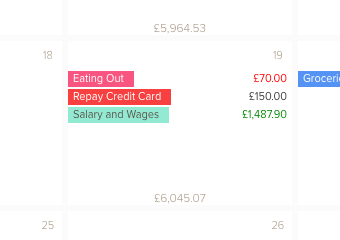 If you aren’t viewing both accounts that contain the transfer budget on the Calendar page, a transfer budget will be shown in red or green to reflect whether it is an income or expense budget in that account. However, when viewing both accounts that contain both sides of the transfer, the amount will be shown in black (rather than in red or green like income and expense budgets). 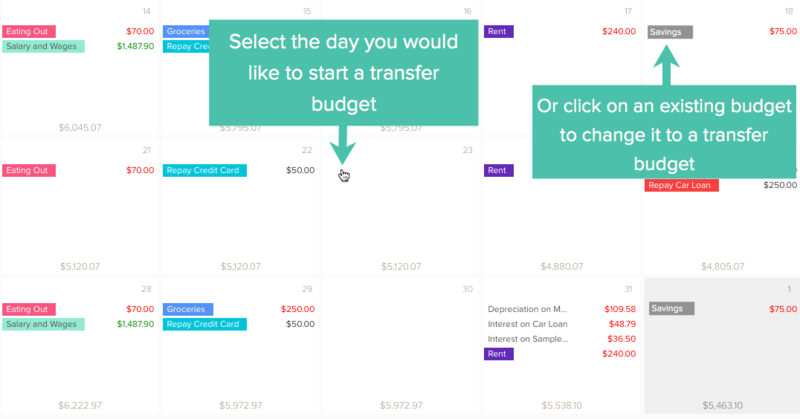 You can easily locate a transfer budget on the Budget page to see how you’re tracking for that period. They will show with a transferred amount, compared to spent or earned for income and expense budgets. You might transfer money to a loan, debt or asset that is not associated with a transaction account connected to PocketSmith. If this is the case, you can add a liability or asset into PocketSmith and still track transfers to them with a transfer budget! This might be for something like a personal loan, a car loan, or any assets that aren't connected to a transaction account.